Overdose rates have now surpassed motor vehicle accidents as the leading cause of accidental death in the country. However, given marijuana’s pain-relieving benefits, it presents a promising solution to reducing opioid misuse, dependence and overdose in the United States. With the striking increase in opioid overdoses nationwide and in New York, the conversation has shifted to alternative treatments not only for the condition for which pain medication is needed, but to help those dependent on opioids reduce or eliminate their use. Many people do not want to take opioids and many doctors would prefer not to prescribe opioids, given the side effects and risks associated with their use. Research has suggested that some patients have turned to marijuana as a safer alternative to their previous medications, especially opioids. 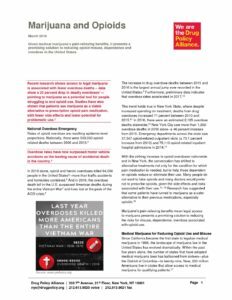 Recent research shows access to legal marijuana is associated with fewer overdose deaths – data show a 25 percent drop in deadly overdoses – pointing to marijuana as a potential tool for people struggling to end opioid use. Studies have also shown that patients see marijuana as a viable alternative to prescription opioid pain medication, with fewer side effects and lower potential for problematic use. Legalizing marijuana will not be the sole answer to the country’s problem with opioid misuse and overdose deaths. However, available evidence indicates that marijuana could be used along with other harm reduction strategies as part of a necessarily diverse and innovative approach to this combating this crisis.